Griffin M. Furlong grew up living in shelters, borrowed couches and hotels. He doesn’t wake up in his own bed or the same bed in the morning. He and his family have been homeless for 12 years. That has been his situation ever since cancer stole the life of his mother 12 years ago. One night he was in a hotel laying in a bed. He didn’t have anything to eat. He said he was starving. He had school the next day. He knew there was nothing he could do. 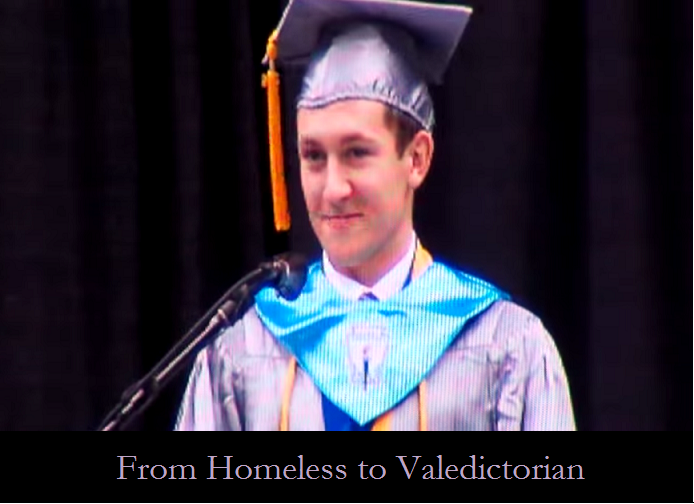 His teachers didn’t really know he was homeless. A teacher said, Griffin has never missed an assignment. On the brim of his baseball caps, he writes, “never give up,” so he never forgets. He wants to show people that anyone can do it! Congratulations Griffin. Thanks for being an inspiration. There is a video below from ABC News and also a video of his graduation commencement speech here (it’s taken with a cell phone so it’s shaky, but good content).